The idea for Sketchy Transport developed over several years. Using combinations of interchangeable paintings and drawings on easels, the installation and scale vary according to space. N.B. 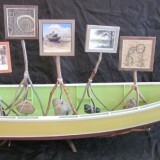 : 3 new easels now replace those sold at The Marina Gallery and the Baltimore 2013 exhibitions.